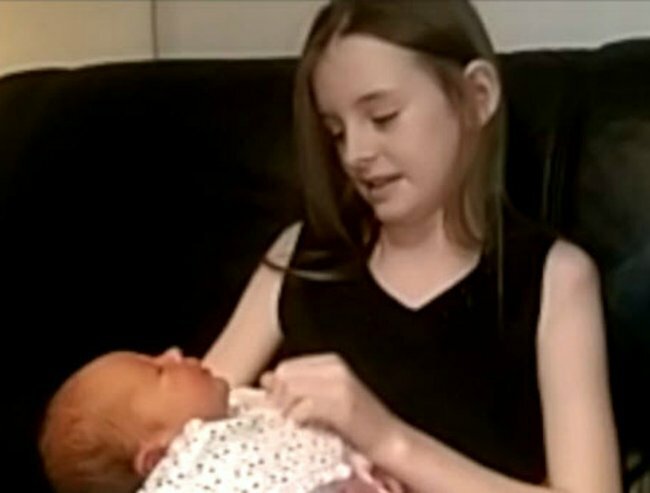 A young girl delivers baby sister at 11 years of age. An 11yo from Tamworth delivered her own sister before the school day began. An 11-year-old, and the eldest of five children has just delivered her little sister hours before heading off to class for the day. Cailtin Burke delivered her baby sister by herself when her mum’s waters broke at their home in Dordon. The young girl from Tamworth, UK was guided by ambulance officers over the phone who told her how to deliver the baby. She was even instructed on how to unravel the chord from around the baby’s neck. Caitlin Burke with her baby sister. Image via Birmingham Mail. She calmly delivered her baby sister, Elsa-Monet and laid her in her mum, Tara Knightley’s arms. Not long after the delivery, Burke went to school and attended classes, like it was just another normal day. Tara&apos;s waters broke just 10 minutes after her partner left their home. It all happened very early - at about 5 am on Tuesday morning. So Caitlin took control, called the ambulance and guided her mum through the birth. Now the eldest child has ambitions to be a midwife in the future because she was so inspired by the events that took place. “My friends at school and the teachers were really happy and proud of me. I want to be a midwife when I’m older," she told the Birmingham Mail. Caitlin&apos;s mum was only in labour for two hours. She gave birth to her fifth child just after 7 am. She couldn&apos;t stop gushing about her eldest daughter&apos;s achievement. “I don’t know what I would have done if Caitlin had not been there...I started getting contractions so my partner left to take my youngest to his sister’s house...But within 10 minutes of him leaving, my waters broke," she told the Birmingham Mail. Caitlin feeding her new sister. Image via Birmingham Mail. The stay-at-home mum said she was screaming during labour while her 11-year-old kept calm. Her daughter didn&apos;t freak out when she first saw the head. Her mum says she couldn&apos;t do what Cailtin did at her age, let alone when she was still in school. “She got the towels, she then helped remove the chord because it was wrapped around the baby. And she helped to rub and stimulate her because she wasn’t crying," Tara told the UK publication. "We are all so proud of her." How would you handle having to deliver a baby while getting instructions over the phone?